In a previous post, I showed a map of the closing schools in Baltimore. 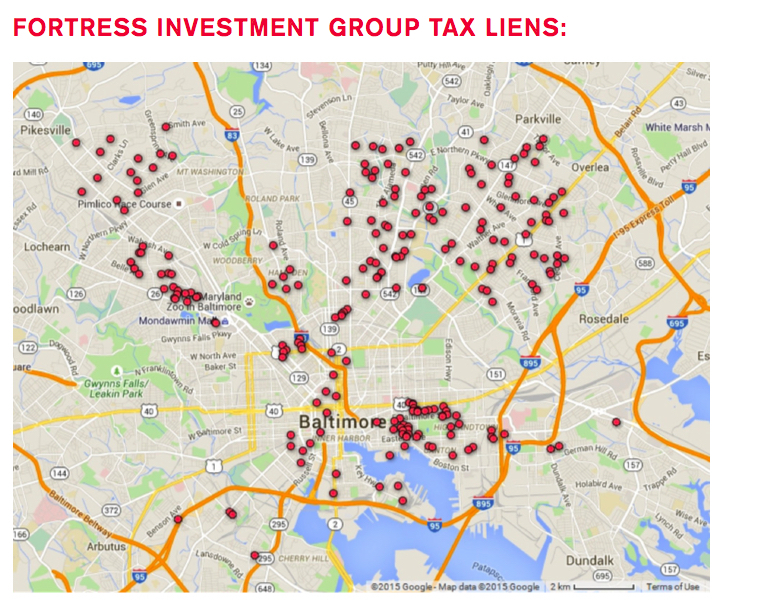 Here is another map created by Hedgeclippers, a group that tries to expose the unjust the operations of hedge funds. This map is surprisingly (or unsurprisingly) similar to the map of school closings in Baltimore. Here we see the red dots in the same communities where schools are closing. The red dots on this map indicate places in which Fortress Investment, a hedge fund, has bought debt. These debts could be as small as a $250 overdue water bill. The collection of debts is owned by Fortress which charges, in some cases, over 18% interests to its borrowers. These are folks that are Baltimore’s poorest residents, who will likely lose their homes as the result of this situation. The city of Baltimore, one the few cities to do this, sold off its tax liens to the highest bidder. Fortress, in this case, which describes itself as a “garbage collector,” won the bid, and will likely make a fortune off of the debts when residents are unable to pay. They will reclaim houses, property, and even wages of Baltimore’s poorest. This is all happening in the neighborhoods where Baltimore’s schools are closing. School closings, in this case, seem to be symptomatic of a much larger problem to squeeze out the poor in Baltimore. While the hedgefunders make no claims to any wrong-doing, they are clearly profiting off of the destruction of Baltimore’s neighborhoods. No reform plan to improve schools or to augment community services will be able to combat this plan to gut the communities that house Baltimore’s poor. It may not be long until profit is made on the closed schools as well. Milwaukee is getting ready to sell its closed school buildings, which housed low performing schools just like in Baltimore. Selling off the resources of the poorest communities will inevitably eviscerate those communities. Perhaps that is the intention.